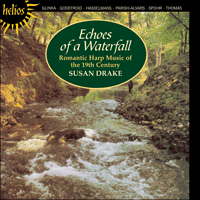 This recording presents a programme of romantic music, virtually unknown except to its performers, for perhaps the most romantic of all instruments—the harp. The ancestors of the instrument stretch long back into antiquity. Its forbear the lyre, for instance, can be seen among the stone paintings of ancient Egypt and on Greek earthenware from 2000BC, and there are references to it in the Bible (‘Praise the Lord with harp’—Psalm 33). The simplicity of those early harps, though, has long since been left behind and their modern descendent is a very complex instrument indeed. The note given out by a vibrating string, on whatever instrument, is governed by its length: the longer the string, the lower the note. Clearly, then, a string of fixed length has to be shortened, or ‘stopped’, to change its note to a higher pitch. On the violin, cello or guitar, for instance, this is done by using the fingers to depress the string on to the neck or fretboard, and all that is required is a high degree of finger agility to play these instruments in a variety of keys, modulating from one to another with the highest speed. This, however, cannot be done on the harp for two main reasons: there is no fretboard to provide support, and in any case its player needs both hands to pluck the strings. This limitation was solved in the nineteenth century with the invention of the pedal harp. The modern harpist, like the organist, now needs agile feet as well as hands, since the body of the instrument hides a complicated mechanism of levers, operated by pedals, which enables the player to alter the pitch of the strings and thus play and modulate in a variety of keys previously inaccessible to it. The invention of this sophisticated instrument enabled composers to write music of much more colour and variety, and on this record will be found part of the subsequent legacy of music from the richest period of the harp’s history, the nineteenth century. Like other instruments, the harp had, and has, its share of virtuoso performers, many of them writing prolifically for it. Alphonse Hasselmans was born in Liège, Belgium, in 1845 and studied in Strasbourg, Germany, with Gottlieb Kruger who himself had been a student of Parish-Alvars (see below). In 1884 he became professor of harp at the Paris Conservatoire, a position he held until his death in 1912. Hasselmans played a major role in the revival of interest in harp-playing towards the end of the nineteenth century. A good many compositions by other composers were inspired by his virtuoso playing and were dedicated to him, among them Fauré’s Impromptu, Op 86. Hasselmans himself did not attach much importance to his own compositions but his charming salon pieces, of which three are included on this record, added greatly to the harp’s repertoire, not least in their technical value. Elias Parish-Alvars was born in Teignmouth, Devon, in 1808 and studied the harp with Théodore Labarre, François Dizi and Robert Bochsa before becoming the most celebrated performer of his day. He was greatly admired by Mendelssohn, and by Berlioz who called him ‘the Liszt of the harp’. He toured Europe from 1831 to 1836 and the near East from 1838 to 1841. His compositions include many of the national melodies of the countries he visited. He is reputed to have had a formidable technique (it is said that he played at sight, on the harp, the Chopin piano sonatas and the Beethoven and Hummel concertos) and many of his pieces must be among the most demanding in the harp’s literature. He was appointed chamber harpist to the Emperor of Austria in 1847 but died in Vienna only two years later of consumption. The Belgian harpist-composer Félix Godefroid (born Namur, 1818; died Villers-sur-Mer, 1897) was a pupil of François Nadermann, the first professor of harp at the Paris Conservatoire from 1825 to 1835. He travelled extensively throughout Europe on concert tours. His opera The Golden Harp was performed in Paris in 1858 but it is for his concert pieces and studies for solo harp that he will be mainly remembered. The Russian Mikhail Glinka (1804–1857) is perhaps much more familiar to us than some of his companions on this record. Generally described as ‘the father of Russian music’ he was of course the composer of much else besides harp music. These variations on a theme adapted from Mozart’s Don Giovanni (‘Là ci darem la mano’) are an early example of his work and were later transcribed by the composer for the piano. John Thomas was born in Bridgend, South Wales, in 1826. At the age of eleven he won a harp at a National Eisteddfod and three years later, in 1840, Lord Byron’s daughter Ada, the Countess of Lovelace, sent him to the Royal Academy of Music in London, where he studied the instrument with J B Chatterton. In 1851 he played in the orchestra of the Opera and made the first of the many tours of Europe, continued over the next fifty years. In addition to many appearances throughout Britain and the continent he also adjudicated regularly at his native Welsh Eisteddfodau. On 4 July 1862 he gave a concert of Welsh music at St James’s Hall, London, with a chorus of four hundred accompanied by twenty harps! Among his numerous compositions for harp, both solo and concerted, John Thomas published a collection of Welsh melodies and arrangments of Schubert songs and Mendelssohn’s Songs Without Words. Both Bugeilio’r gwenith gwyn and Merch Megan, recorded here, are in the form of variations on traditional Welsh airs, whereas Echoes of a Waterfall is an original piece. Although he played the pedal harp rather than the triple-strung Welsh harp, Thomas was given the bardic name of ‘Pencerdd Gwalia’—‘Chief Musician of Wales’—in 1861. In 1872 he became harpist to Queen Victoria. He died in London in 1913. The celebrated violinist Louis Spohr (1784–1859) had studied the harp as a boy in his native Brunswick. In 1806 he married the harpist Dorette Scheidler and began writing for the instrument to great effect. The harp of Spohr’s day was a smaller instrument than is used now, and to allow for greater resonance, and lessen the possibility of breaking strings, he tuned Dorette’s harp a semitone lower than the normal pitch. He would then write the harp part in a flat key, and a violin part for himself in a sharp key a semitone lower. That is to say, the harp in E flat would be in perfect accord with the violin in D. The set of variations recorded here, on an air by the Paris opera composer Étienne Nicholas Méhul (1763–1817) was composed in 1807 and makes great technical demands on the performer. Ce disque présente un programme de musique romantique, virtuellement inconnue sauf de ses exécutants, pour peut-être le plus romantique de tous les instruments, la harpe. Les ancêtres de cet instrument remontent à l’antiquité. On peut voir son aïeule la lyre, par exemple, sur les pierres peintes de l’ancienne Egypte et sur la poterie grecque de l’an 2000 av. J-C et l’Ancien Testament se réfère à cet instrument («Louez le Seigneur avec la harpe», Psaume 33). Mais la simplicité de ces premières harpes a été dépassée depuis longtemps et son descendant moderne est un instrument vraiment très compliqué. La note que donne une corde vibrante, quel que soit l’instrument, est régie par la longueur de la corde; plus la corde est longue, plus la note est basse. C’est ainsi qu’une corde de longueur fixe à doit être raccourcie ou «arrêtée» pour en changer la note en un son plus haut. Sur le violon, le violoncelle ou la guitare, par exemple, on y parvient en utilisant les doigts pour appuyer sur la corde à hauteur du manche ou de la frette et il suffit d’avoir une grande agilité des doigts pour jouer de ces instruments dans une variété de tonalités, modulant de l’une à l’autre le plus vite possible. Mais c’est impossible avec la harpe pour deux raisons essentielles: la harpe ne possède pas de frette pour donner le support voulu et de toutes façons le harpiste a besoin de ses deux mains pour pincer les cordes. Cette limitation a été résolue au dix-neuvième siècle avec l’invention de la harpe à pédales. Le harpiste moderne, tout comme l’organiste, a maintenant besoin d’avoir les pieds aussi agiles que les mains car la caisse de l’instrument cache un mécanisme compliqué de leviers actionnés par les pédales ce qui permet au musicien de modifier la sonorité des cordes et par conséquent de jouer et de moduler dans toute une variété de tonalités auparavant inaccessibles à cet instrument. L’invention de cet instrument perfectionné a permis aux compositeurs d’écrire de la musique beaucoup plus colorée et variée et vous trouverez sur ce disque une partie du legs musical subséquent datant de la période la plus riche de toute l’histoire de la harpe, le dix-neuvième siècle. Tout comme d’autres instruments, la harpe a eu et a ses virtuoses dont nombreux d’entre eux sont aussi des compositeurs prolifiques pour cet instrument. Alphonse Hasselmans est né à Liège en Belgique en 1845 et il étudia à Strasbourg, alors rattaché à l’Allemagne, auprès de Gottlieb Kruger qui avait été lui-même élève de Parish-Alvars (voir ci-dessous). En 1884 il était nommé professeur de harpe au Conservatoire de Paris, un poste qu’il conserva jusqu’à sa mort en 1912. Hasselmans a joué un rôle important dans le renouvellement de l’intérêt pour la harpe vers la fin du dix-neuvième siècle. De nombreuses œuvres d’autres compositeurs ont été inspirées par la virtuosité de son jeu et lui furent à dédiées, parmi lesquelles l’Impromptu, Opus 86 de Fauré. Hasselmans lui-même n’attachait pas beaucoup d’importance à ses propres compositions mais ses charmants morceaux de salon, dont trois sont inclus ici, ont beaucoup apporté au répertoire de musique pour harpe et leur valeur technique ne doit pas être sous-estimée. Elias Parish-Alvars est né à Teignmouth dans le Devon, Angleterre, en 1808 et étudia la harpe avec Théodore Labarre, François Dizi et Robert Bochsa avant de devenir le harpiste le plus renommé de son époque. Mendelssohn et Berlioz, qui l’appela «le Liszt de la harpe», l’admiraient beaucoup. Il voyagea en Europe de 1831 à 1836 et au Proche-Orient de 1838 à 1841. Ses œuvres englobent de nombreuses mélodies nationales des pays qu’il visita. Il est réputé pour sa technique formidable (on dit qu’il jouait à vue à la harpe, les sonates pour piano de Chopin et les concertos de Beethoven et de Hummel) et nombreuses de ses œuvres comptent parmi les plus difficiles du répertoire de la harpe. Il fut nommé harpiste de chambre près l’Empereur d’Autriche en 1847 mais mourut à Vienne de consomption pulmonaire deux ans plus tard seulement. Le harpiste-compositeur belge Félix Godefroid (né à Namur en 1818 et mort à Villers-sur-Mer en 1897) fut l’élève de François Nadermann, le premier professeur de harpe du Conservatoire de Paris de 1825 à 1835. Il voyagea énormément dans toute l’Europe pour donner des concerts. Son opéra La harpe d’or fut joué à Paris en 1858 mais c’est pour ses œuvres de concert et études pour harpe seule qu’on à se souvient essentiellement de lui. Le russe Mikhail Glinka (1804–1857) est peut-être bien le harpiste que nous connaissons le mieux des musiciens représentés sur ce disque. Généralement décrit comme «le père de la musique russe», il était bien sûr compositeur de nombreuses autres œuvres outre les morceaux pour harpe. Ces variations sur un thème adapté du Don Giovanni de Mozart («Là ci darem la mano») sont un exemple précoce de son œuvre et furent plus tard transcrites pour le piano par le compositeur. John Thomas est né à Bridgend dans le sud du Pays de Galles en 1826. Agé de onze ans il remportait la harpe à l’occasion d’un concours national de poésie, musique et chant (Eisteddfod) et trois ans plus tard, en 1840, la fille de Lord Byron, Ada, comtesse de Lovelace, l’envoyait à l’Académie Royale de Musique à Londres où il étudia l’instrument avec J B Chatterton. En 1851 il jouait avec l’orchestre de l’opéra et fit la première de ses nombreuses tournées en Europe qui devaient se poursuivre pendant les cinquante années suivantes. En plus de paraître fréquemment en public dans toute la Grande Bretagne, il continua régulièrement à faire partie du jury de ces concours de poésie et de musique dans son Pays de Galles natal. Le 4 juillet 1862 il donna un concert de musique galloise à St James’s Hall, à Londres, avec 400 choristes et 20 harpes. Parmi ses nombreuses œuvres pour harpe, seule et d’ensemble, il publia un recueil de mélodies galloises et des arrangements des chants de Schubert et des Chants sans paroles de Mendelssohn. Bugeilio’r gwenith gwyn («En regardant le blé») et Merch Megan («La fille de Megan») enregistrés ici, sont deux morceaux en forme de variations sur des airs traditionnels gallois tandis que Echoes of a Waterfall («Echos d’une chûte d’eau») est une œuvre originale. Bien qu’il jouait la harpe à pédales plutôt que la harpe galloise à cordes triples, il reçut le nom barde de «Pencerdd Gwalia» («Musicien en chef du Pays de Galles») en 1871. En 1872 il était nommé harpiste près la Reine Victoria. Il mourut à Londres en 1913. Le célèbre violoniste Louis Spohr (1784–1859) étudia la harpe dans sa ville natale de Brunswick alors qu’il était enfant. En 1806 il épousa la harpiste Dorette Scheidler et commença à écrire avec le plus grand effet pour cet instrument. A l’époque de Spohr la harpe était un instrument plus petit qu’elle ne l’est maintenant et afin d’obtenir une plus grande résonance et réduire la possibilité de casser les cordes, il accorda la harpe de Dorette un demi-ton plus bas que la normale. Puis il composait la partition pour harpe en bémol et la partition pour violon, qui lui était destinée, en dise un demi-ton plus bas. C’est-à-dire que la harpe en mi bémol était en parfait accord avec le violon en ré. La série de variations enregistrées ici, sur un air du compositeur de l’opéra de Paris, Étienne Nicholas Méhul (1763–1817) fut composée en 1807 et exige une grande technique de la part de l’exécutant. Auf der vorliegenden Platte befindet sich eine Auswahl von romantischer Musik, die außer ihren Darbietern allgemein kaum bekannt ist, des vielleicht romantischsten aller Instrumente—der Harfe. Die Vorfahren des Instruments reichen bis in die Antike zurück. Ihr Vorläufer, die Leier zum Beispiel, kann man auf altägyptischen Steinmalerein und auf griechischem Steingut von 2000 vor Christus sehen, und sie wird in der Bibel erwähnt („Danket dem Herrn mit Harfen“, Psalm 33). Die Einfachheit dieser frühen Harfen ist jedoch schon lange ein Ding der Vergangenheit und ihr moderner Nachfolger ist in Wirklichkeit ein sehr kompliziertes Instrument. Der Ton, der durch eine in Schwingung versetzte Saite, gleich auf welchem Instrument, erzeugt wird, wird von deren Länge bestimmt: Je länger die Saite, desto tiefer der Ton. Dementsprechend muß eine Saite mit einer festen Länge zur Veränderung der Tonhöhe verkürzt oder „gestopft“ werden. Auf der Violine, dem Cello oder der Gitarre, zum Beispiel, werden dazu die Saiten mit den Fingern auf den Hals oder das Griffbrett niedergedrückt. Die einzige Vorraussetzung, um diese Instrumente in verschiedenen Tonarten zu spielen und mit größter Geschwindigkeit von einer Tonart zur anderen zu wechseln, ist große Beweglichkeit der Finger. Dies ist jedoch auf der Harfe aus zwei wichtigen Gründen nicht möglich: Kein als Stütze dienendes Griffbrett ist vorhanden, und der Spieler benötigt in jedem Fall beide Hände, um die Saiten anzuzupfen. Dieser Beschränkung wurde im neunzehnten Jahrhundert mit der Erfindung der Pedalharfe abgeholfen. Der moderne Harfenist muß, ebenso wie der Organist, außer beweglichen Händen auch bewegliche Füße besitzen, denn im Schallkörper des Instruments verbirgt sich eine komplizierte Vorrichtung von Hebeln, die von Pedalen betätigt werden, welche ihrerseits den Spieler in die Lage versetzen, die Tonhöhe der Saiten zu verändern und daher in einer Anzahl von Tonarten zu spielen und sie zu wechseln, wie es bis dahin unmöglich war. Die Erfindung dieses hochentwickelten Instruments machte es Komponisten möglich, Musik mit mehr Klangfarbe und von größerer Vielfalt zu schreiben. Auf dieser Platte befindet sich ein Teil des daraufhin entstandenen musikalischen Erbes aus der an Werken für die Harfe reichsten Epoche, dem neunzehnten Jahrhundert. Genauso wie für andere Instrumente gab es für die Harfe, und gibt es noch immer, ihren Anteil an virtuosen Künstlern, von denen viele sehr produktiv für das Instrument komponiert haben. Alphonse Hasselmans wurde 1845 in Liège, Belgien, geboren und studierte in Straßburg unter Gottlieb Kruger, der selbst ein Schüler von Parish-Alvars (siehe unterhalb) gewesen war. Er wurde 1884 zum Professor der Harfe am Pariser Konservatorium ernannt, eine Stellung, die er bis zu seinem Tod im Jahre 1912 innehatte. Hasselmans spielte bei dem wiederauflebenden Interesse an Harfenspiel gegen Ende des neunzehnten Jahrhunderts eine bedeutende Rolle. Eine beträchtliche Anzahl von Werken anderer Komponisten wurden durch sein virtuoses Spiel angeregt und wurden ihm gewidmet, darunter Faurés Impromptu, Op 86. Hasselmans selbst maß seinen eigenen Kompositionen keine große Bedeutung bei, aber seine charmanten Salonstücke, von denen sich drei auf dieser Platte befinden, trugen erheblich zum Repertoire der Harfe bei, nicht zuletzt durch ihren spieltechnischen Wert. Elias Parish-Alvars wurde 1808 in Teignmouth, Devon, geboren und studierte die Harfe unter Théodore Labarre, François Dizi und Robert Bochsa und wurde dann der berühmteste Harfenist seiner Zeit. Mendelssohn bewunderte ihn sehr und Berlioz ebenso. Er nannte ihn „den Liszt der Harfe“. Er ging in Europa von 1831 bis 1836 auf Tournee und im Nahen Osten von 1838 bis 1841. Viele der Volksmelodien der Länder, die er besuchte, finden sich in seinen Kompositionen wieder. Man sagt ihm nach, er habe eine beeindruckende Spieltechnik gehabt (wie es heißt, spielte er Chopins Klaviersonaten und Beethovens und Hummels Konzerte auf der Harfe vom Blatt), und viele seiner Stücke müssen zu den anspruchvollsten des Repertoires für Harfe zählen. Er wurde 1847 zum Kammerharfenist des Kaisers von Österreich ernannt, starb aber nur zwei Jahre später in Wien an Schwindsucht. Der belgische Harfenist-Komponist Félix Godefroid (geboren 1818, Namur; gestorben 1897, Villers-sur-Mer) war ein Schüler von François Nadermann, der von 1825 bis 1835 der erste Professor der Harfe am Pariser Konservatorium war. Er ging ausgedehnt auf Konzerttourneen in ganz Europa. Seine Oper Die goldene Harfe wurde 1858 in Paris aufgeführt, aber man erinnert sich hauptsächlich wegen seiner Konzertstücke und Etüden für Soloharfe an ihn. Der Name des Russen Mikhail Glinka (1804–1857) ist uns wahrscheinlich viel vertrauter als die Namen der anderen Künstler und Komponisten auf dieser Platte. Allgemein angesehen als „der Vater der russischen Musik“ komponierte er natürlich neben Harfenmusik vieles andere. Diese Variationen zu einem von Mozarts Don Giovanni adaptierten Thema („Là ci darem la mano“) sind ein frühes Beispiel seiner Arbeit und wurden später von ihm für das Klavier transkribiert. John Thomas wurde 1826 in Bridgend in Südwales geboren. Im Alter von elf Jahren gewann er eine Harfe auf den nationalen Eisteddfod und drei Jahre später, 1840, sandte ihn Lord Byrons Tochter Ada, die Gräfin von Lovelace, zur Royal Academy of Music in London, wo er unter J. B. Chatterton die Harfe studierte. Im Jahre 1851 spielte er im Ochester der Oper und ging zum ersten Mal auf eine der vielen Tourneen, die er in den folgenden 50 Jahren unternahm. Zusätzlich zu vielen Auftritten in ganz Großbritannien und auf dem europäischen Festland, war er auch regelmäßig Preisrichter bei den Eisteddfod in seiner walisischen Heimat. Am 4. Juli 1862 gab er ein Konzert walisischer Musik in der St. James’s Hall, London, mit einem Chor von 400 Personen und 20 Harfen. Unter seinen zahlreichen Kompositionen für Harfe, sowohl solistischen als auch mehrstimmigen, veröffentlichte er eine Kollektion von walisischen Melodien und Arrangements von Schuberts Liedern so wie Mendelssohns Lieder ohne Worte. Sowohl Bugeilio’r gwenith gwyn als auch Merch Megan, die hier aufgenommen sind, haben die Form von Variationen über herkömmliche walisische Weisen, während Echo eines Wasserfalls ein ursprüngliches Werk ist. Obwohl er die Pedalharfe statt der tripelbespannten walisischen Harfe spielte, wurde er 1861 mit dem bardischen Namen „Pencerdd Gwalia“—„Hauptmusiker von Wales“ geehrt. Er wurde 1872 zu Königin Victorias Harfenistem benannt. Er starb 1913 in London. Der gefeierte Violinist Louis Spohr (1784–1859) hatte als Knabe in seiner Heimatstadt Braunschweig die Harfe spielen gelernt. Er heiratete 1806 die Harfenistin Dorette Scheidler und begann mit großem Erfolg für das Instrument zu schreiben. Zu Spohrs Zeit war die Harfe ein kleineres Instrument als das, welches heute in Gebrauch ist, und um größere Resonanz zu erzeugen und die Gefahr, daß die Saiten reißen könnten, zu vermindern, stimmte er Dorettes Harfe einen Halbton tiefer als die normale Tonhöhe. Er schrieb dann die Harfenstimme in einer erniedrigten Tonart und eine Violinstimme für sich selbst in einer erhöhten Tonart einen Halbton tiefer. Das bedeutet, daß die Harfe in es mit der Violine in d perfekt übereinstimmt. Die hier aufgenommene Reihe von Variationen, über eine Melodie des Pariser Opernkomponisten Étienne Nicholas Méhul (1763–1817), wurde 1807 komponiert und stellt große spieltechnische Ansprüche an den Künstler.